France has recorded more than 2,500 cases of measles in the year to May 2018, including three deaths and high rates of hospitalisation (22%). The outbreak has killed three people this year. By March, 429 cases had been recorded in France but this has risen sharply in the second quarter of 2018. French authorities believe the outbreak may now have peaked but, due to high numbers of unvaccinated citizens, the risk of future epidemics remains. Only Italy (3,697) and Greece (3,039) have reported more cases of measles, with Romania (1,198) close behind France. Many European countries, where MMR vaccination rates are higher, have almost no cases. However, the goal of eliminating measles from Europe is undermined by a handful of countries. The outbreak is, sadly, not surprising. Vaccination rates in France are among the worst in Europe. If 95% of people have two doses of the MMR vaccine, the population – including those too young and too sick to be vaccinated – would be protected. However, in France, fewer than 85% have had two doses of the vaccine. It has suffered recurring outbreaks for the past decade, including in 2011 when almost 4,000 people were infected. A global survey of 67 countries found that confidence in vaccine safety in France is the worst in the world. Low confidence in vaccination feeds low uptake, increasing the risk of outbreaks. The link between low vaccination rates and outbreaks is very well established but is illustrated by the maps of MMR uptake and measles outbreak. France, Italy, Greece and Romania are suffering severe epidemics; the Baltic and Scandinavian countries have very few cases – some months they record zero cases. The Americas have been declared measles-free. In short, measles outbreaks have a disproportionate impact on the young and people with chronic diseases. In particular, those with compromised immune systems – who cannot have vaccines that can boost healthy people’s immune systems – are at higher risk of hospitalisation and death if exposed to the measles virus. Half of all cases were in people aged less than 15 years of age. The highest incidence rate is in children aged under one year of age. The first dose of MMR vaccine is typically given in the child’s first year of life (see vaccine schedules in your country). Measles cases in children under one year of age are associated with subacute sclerosing panencephalitis (SSPE) later in life. This disease can strike more than a decade after initial infection and is always fatal. Experts now believe that measles death rates have been underestimated. Public Health France says the epidemic began in New Aquitaine in November 2017 but that this outbreak has been in decline since March 2018. No new cases have been reported there in the past 30 days, apart from among family members of those infected previously – this suggests the virus may, for now, not be spreading in the community. However, the outbreak spread beyond New Aquitaine several months ago to six other regions. Local epidemics have spread from a hospital in Brittany, creches and schools in Ile-de-France (which includes Paris), creches and schools in Hauts-de-France, a school in Normandy, two schools in Pays-de-Loire, and a school in Provence-Alpes-Côte d’Azur. ‘Insufficient vaccination is the main factor in the epidemic,’ according to authorities. 88% of measles cases occurred in people who had not had two doses of MMR. Severe cases of measles have been reported in all affected regions. 22% of reported cases have had to be hospitalised. The latest death is a 17-year-old immunocompromised individual. This follows the death of another 26-year-old immunocompromised individual early this year. It is thought that both were infected by an unvaccinated family member. 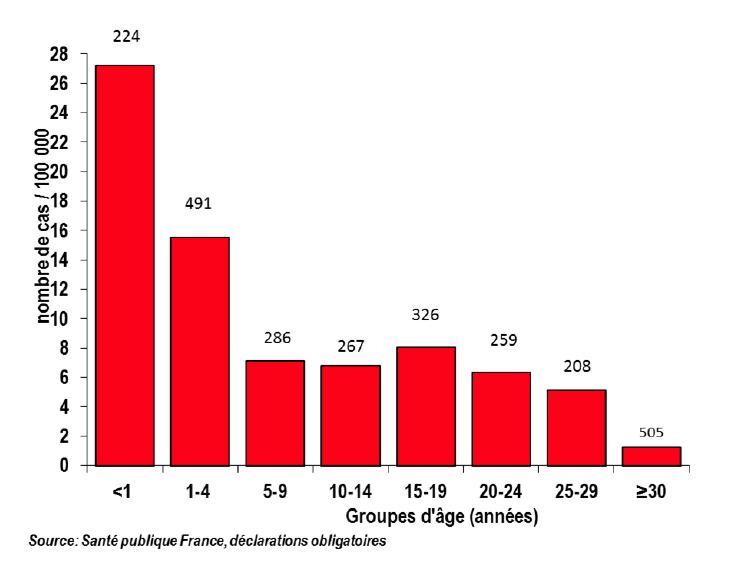 During the 2008-2011 measles outbreaks in France, seven of the 10 deaths were among immunocompomised individuals. On that occasion, the fatalities included people born with immune system problems, a person with Hodgkin’s lymphoma, a person with Crohn’s disease, a person with HIV, and three people receiving immunosuppressive therapy for other illnesses. People who cannot have the MMR vaccine due to illness rely on those around them for ‘community immunity’ or herd immunity. As this video explains, even the spread of highly-infections diseases such as measles can be stopped if 95% of a community has two doses of MMR vaccine. Measles outbreaks in France are neither new nor unpredictable. The video below, made by the ECDC and Euronews in 2012, focused on France for a reason. It had endured a serious measles outbreak that caused misery for thousands of families, put pressure on hospitals and clinics, and claimed 10 lives. It is known that if vaccination rates are far below the 95% target, thousands of people will be infected, hundreds will be hospitalised, some will die. The only unknown is who will be affected next time.